The United States is just months away from losing oversight of some $725 million in Afghanistan development projects, putting the long-term sustainability of the ventures at severe risk. 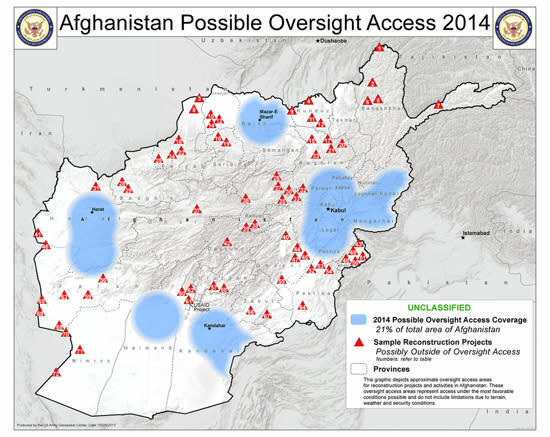 According to the Special Inspector General for Afghanistan Reconstruction (SIGAR), the United States will only have oversight of 21 percent of the country next year. This is a dramatic decline from the peak war years: in 2009, the United States had oversight of 69 percent of Afghanistan; in 2011, this number was 59 percent; and this year, it was 45 percent. But due to the withdrawal of the majority of U.S. troops next summer, and a deteriorating relationship with Afghan President Hamid Karzai, the areas that the United States can oversee are shrinking. Next year, Washington is only expected to have oversight of areas close to big cities, lraving projects in rural parts of the country without supervision. "This will be a serious matter since Afghanistan is an overwhelmingly rural country—76 percent of the population as of 2012-14—so countering Taliban influence over the rural majority of Afghans will also become more difficult as oversight-access zones shrink, thereby further complicating the reconstruction mission," SIGAR chief John Sopko said in testimony to the House Armed Services Committee yesterday. In the same testimony, Sopko warned that the lack of oversight put the right of Afghan women and girls at serious risk. Women’s rights improved in Afghanistan during the U.S. occupation. With troops set to leave, Sopko said many of these gains could be lost. "According to the Kabul Embassy’s Interagency Gender Working Group, key obstacles to education for girls and women include early marriage; restricted movement; insecurity; distance to schools; shortage of female teachers and facilities; competing demands on girls’ and women’s time; the lower value attached to girls and women’s education; and outright opposition to educating females," Sopko said. These findings are in addition to other problems identified by SIGAR in recent reports. SIGAR auditors found that the United States spent $200,000 on a medical facility that was very built, and a $4.2 million police headquarters that was simply unusable. Its quarterly report to Congress also repeated a warning often made by Sopko: Money should not be spent for the sake of spending money. He urged Congress not to continue to throw money at projects that are unlikely to come to fruition. “Maintaining appropriate levels of visibility and accountability is vital – and especially difficult in the Afghan setting,” the report said.